A flat bed trailer was outfitted with a 150 KW generator, two variable speed DC motor drives, and the necessary mechanical equipment to allow computer control of the system as an oil exploration rig. One motor drove the drill, the other drove the hoist. The variable speed drives were SCR inverters with rectifiers to provide a variable DC voltage to each motor. The system had electronic torque limiters. The drilling operation was computer controlled and two computers output a total of 2 analog signals (motor speed) from digital to analog converters and monitored 4 analog signals from tachometers and torque limiters. 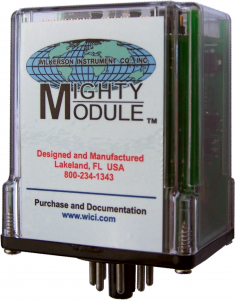 Six of Wilkerson Instrument’s MM4380A Isolated DC Transmitters were used in the analog paths to provide isolation and prevent ground loops. The customer built these Rigs and leased them for oil exploration. The customer called for help when the system did not work properly. All six analog signals had noise, from the SCR drives, imposed on the outputs of the MM4380A signal conditioners. The noise amplitude was as high as the full scale DC process signal. A discussion with the customer revealed they always had severe noise problems with the rigs and the best they ever accomplished was to get the noise down to about 20% of the full scale DC signal. The rigs seemed to work satisfactorily with this noise level so they lived with it. This rig was the first to be built where they had attempted to deal with the noise. The user of the rigs usually parked the rig on a dirt mound about 8 to 10 feet above the surrounding terrain. They drove a ground rod into the earth at the bottom of the mound and used this as the system ground for the rig. The customer faxed Wilkerson Instrument Co. drawings of the wiring of the analog part of the controlled system. It was discovered that all analog signals were run in shielded pairs. The shields were connected to circuit common on the computer as well as the MM4380A. All of the shields were also connected to a common point on the electrical box that held all of the equipment. This box was connected to the system ground. The customer agreed with our suggestion and rewired the shielded cables so the shield of each cable was connected only to the circuit common of the driven device. They were also disconnected from the common ground point (and each other). This simple change dropped the SCR noise to less than 1% of the full scale DC signal and the customer was delighted.